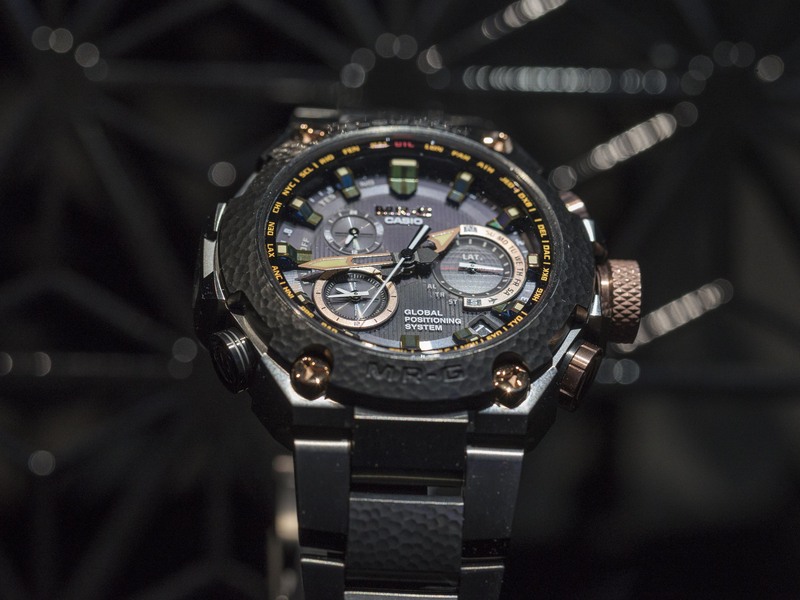 The toughest kid in the watch industry G-Shock is preparing to celebrate the 20th year of its upper level product line Mr-G with a 300 pieces limited edition model. 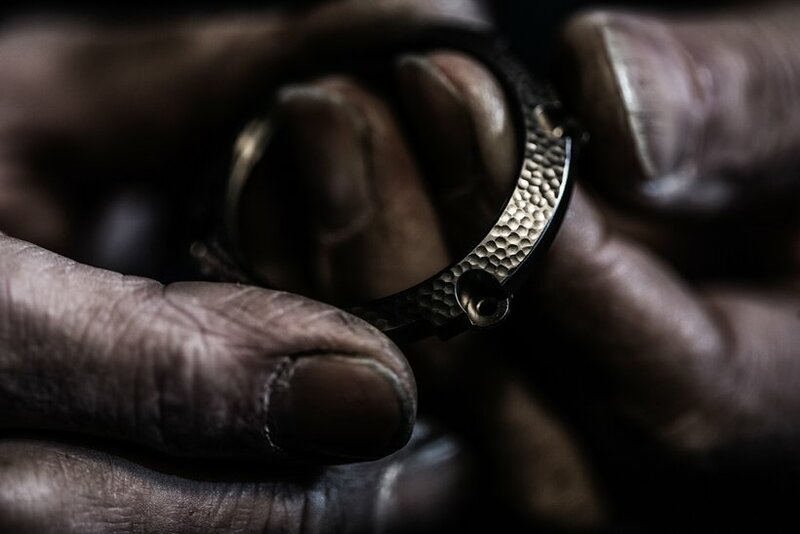 One of the most important parameters in watch making is ‘’ durability ‘’. The history of watchmaking features many different methods and techniques about this important matter especially increased in number after wrist watches became popular. 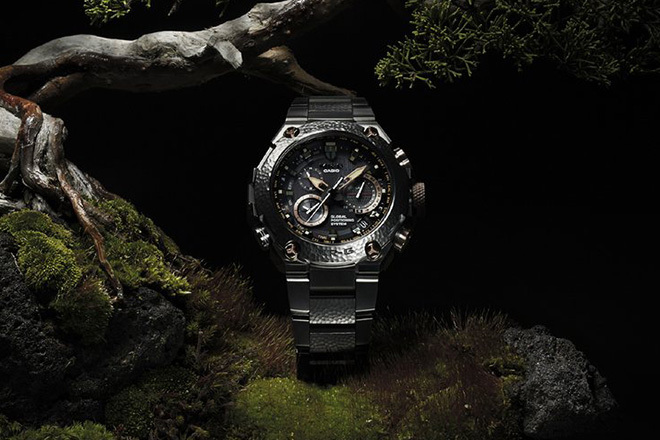 However, there is one unique model which re-defines the world durability with it’s virtually ‘’everything proof’’ structure since 1982: CASIO G-Shock. I believe there is no other product in the world of watches which bear the most direct and honest relation with its purpose of existence. When it comes to tool watches, what we have today are high priced illustrations of the early tool watch examples. However, when we look at the G-Shock we see an extremely durable and functional watch. We may not be seeing the G-Shock in popular culture quite often but the fact is it is a stunning watch worn by a wide spectrum of people like army members, police officers, tactical forces, extreme sports enthusiast etc. A 200, 00 USD G-Shock can practically answer all your requirements from a durable quartz watch accompanied with a virtually indestructible outfit. In the meantime, G-Shock collectors (yes, there are G-Shock collectors) are no different than Rolex or Panerai enthusiasts in terms of passion or knowledge. They dig for the iconic versions, older editions etc. Mr-G series has been added to the G-Shock Collection in 1996. 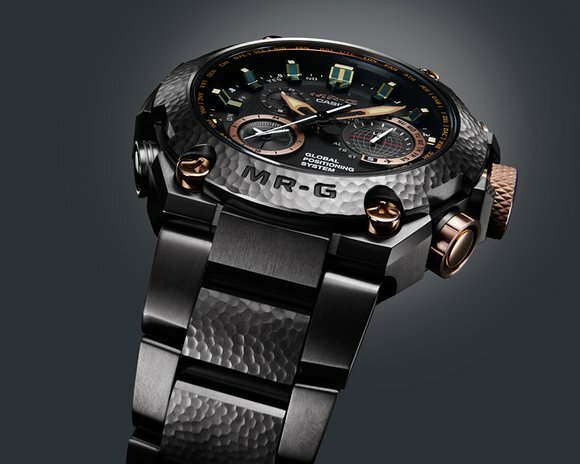 Since then, Mr-G represented the top of the line models of the collection especially carved in to our memories with their iconic stainless steel case and bracelet models. 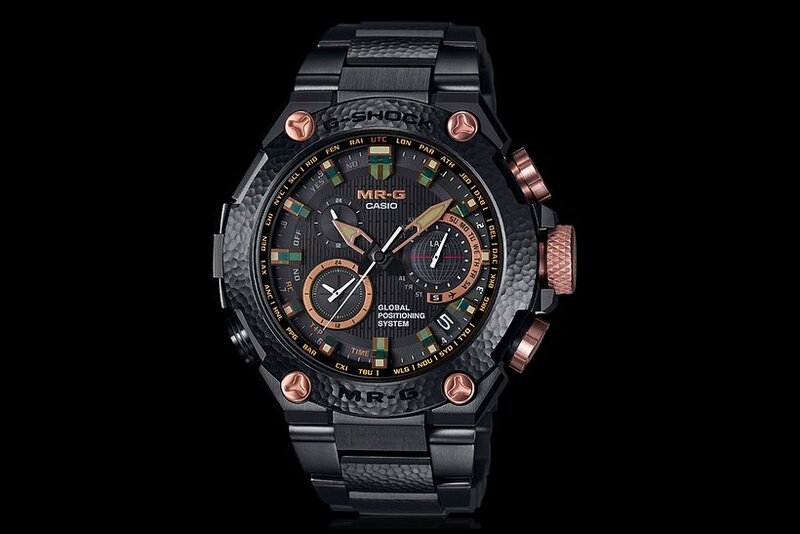 CASIO G-Shock MR-G Limited Edition 'Hammer Tone' model is made to celebrate the 20th anniversary of Mr-G product line. Technically speaking, Hammer Tone offers almost any function you expect from a modern G-Shock. WR200M rating, extreme durability against shocks, a GPS receiver to set 40 different time zones and a solar powered movement. However the models gets its name (and the jaw breaking price tag) from the traditional Japanese art of ‘’tsuiki’’ applied on its bracelet and bezel. 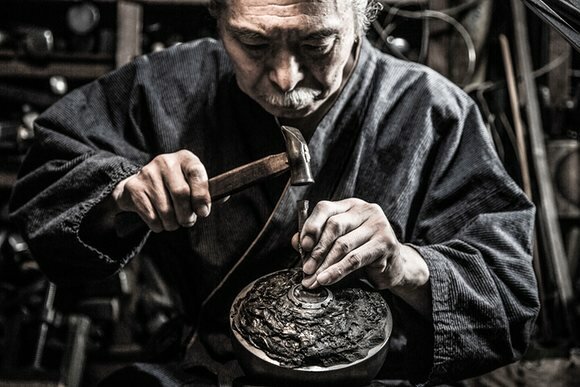 Tsuiki is a form of handcraft art mostly seen on the classic Japanese swords and armors in which a pattern is created on a metal surface through hammering. A well known use of tsuiki was in the making of traditional Japanese arms and armor, and the related technique of tsuchime-ji can often be seen on the tsuba ( hand-guards) of Japanese swords. The case and bracelet of the Hammer Tone are made of DLC-coated titanium, but the hammered bezel and center links are finished with oborogin - an alloy of copper and silver. Oborozuki is an older term for a group of such alloys which were traditionally used on Japanese swords. Other accents including the crown and bezel screws have been ion plated in akagane (a type of copper with the addition of a small amount of gold). Hammer Tone was designed in collaboration with third-generation master metalworker Bihou Asano. This unique collection will be a limited edition of 300 pieces worldwide to celebrate the 20th anniversary of Mr-G product line. Hammer Tone provides an excellent combination of cutting edge Technologies and hundreds of years old traditional Japanese decoration art. Actually, offering products which combines contemporary techniques with traditional decorations is not a solely Japanese thing. In fact, there are many successful models from the Swiss Watch Industry in this regard however there is a slight difference in Hammer Tone which is related to the nature of Japanese culture. Japan is the perfect location for living two edges at the same time in absolute order and comfort. Practically, you may work for designing a water fueled automobile from 9 to 5 and relax dealing with traditional Japanese handcrafts. I generally respect the G-Shock series however I had only a couple of G-Shocks and I am not planning to have another at the moment. 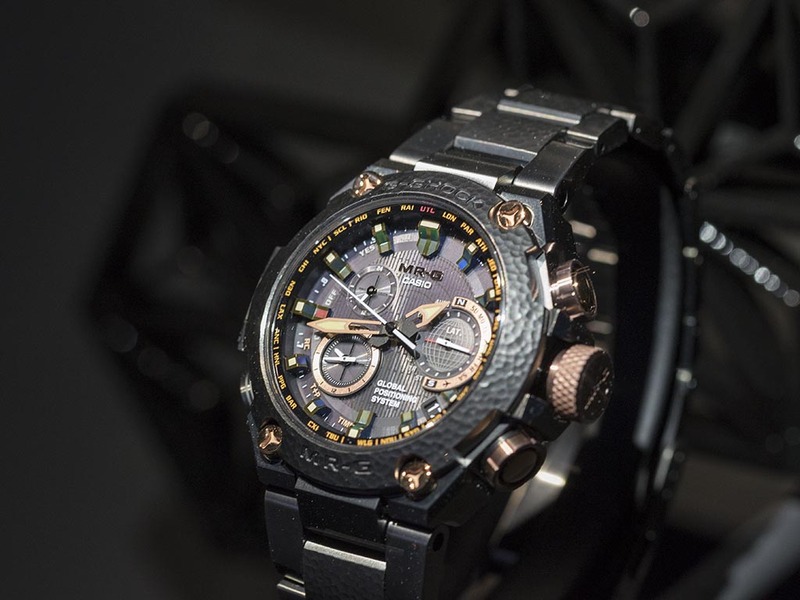 The reasons may be my passion for mechanical watches or my life style which doesn’t seem to be fit with a huge G-Shock anymore however, I still like the idea that created this stunning product. Hammer Tone on the other hand is an interestingly appealing watch for me. Though I will not buy it due to its price tag, I must admit it is the coolest G-Shock I have ever seen. The Hammer Tone will be available in June with a price tag of 6200,00 USD for USA.